STRAIN 2006 COLLECTABLE ORNAMENT – "BATTLEFIELD PRAYER"
Here for your consideration is a signed and numbered limited edition 2006 Collectable Christmas Ornament featuring John Paul Strain’s amazing print "BATTLEFIELD PRAYER" from an edition of ONLY 950 ornaments produced. The momentous day was nearly at hand. On the morrow two great armies would clash along the hills of Fredericksburg, Virginia. The results of the battle might possibly decide the course of the war. Massive numbers of men in gray and blue had been gathering for weeks to engage in an epic battle to defend their homes, traditions, and honor. Weather over the past several days had been pleasant with temperatures rising to the 50's during the day. An inch or so of snow from the storm of December 6th and 7th still remained in the shadows and valleys, but much of the snow had melted. In the hills south of Fredericksburg, Virginia, near Hamilton's Crossing on December 12, 1862, Confederate Generals Robert E. Lee, Stonewall Jackson, and J.E.B. Stuart reconnoitered enemy positions and formulated plans to meet the challenge that lay ahead. A tremendous weight of responsibility lay on the shoulders of these men, for thousands of men's lives and the future of their country now rested with their decisions. 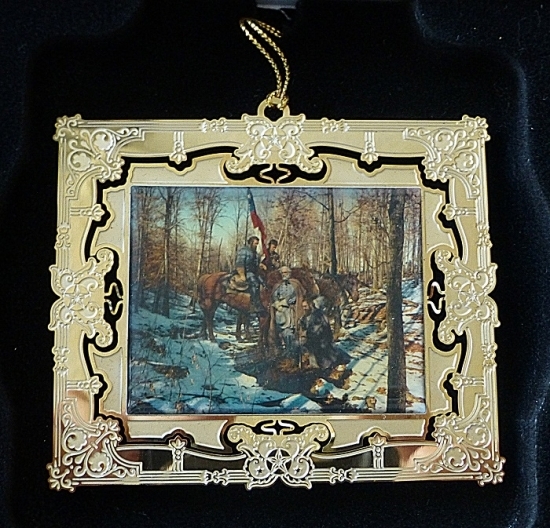 John Paul Strain’s print "BATTLEFIELD PRAYER" featured on the 2006 Christmas ornament depicts the three generals as they paused a moment to rest from their morning ride and water their horses. With the sounds of battle preparation echoing through the woodland hills and valleys, Stonewall Jackson knelt before the Lord and the men prayed for the Lord's blessing and guidance to help them with their great task. Many men would turn to their God before battle, if not for themselves, then for their families. The Almighty would hear thousands of battlefield prayers that day. This gorgeous ornament is individually signed and numbered by the artist, is packaged in a gold foil box embossed with the year and the artist’s name, and comes with a descriptive Certificate of Authenticity.